The administration that was just reelected is plagued by a tremendous lack of leadership, honor and morals. We have been abandoned and conservatives must move forward against this obstruction. We have to clean house in our own party, for instance, the RNC Reince Priebus, all of the ‘established’ campaign machines and someone please yank Karl Rove off Fox News. He was wrong in 2008 and he was wrong in 2012! There are other national ‘established’ Republicans that I am sure you could mention. But what about our own grand state of TEXAS? RedState, a conservative blog for right of center online activists, came out with a blood boiling story on our ‘conservative’ Joe Straus revealing his War on Texas Conservatives with an article on November 4. I doubt any of us were surprised. What was more revealing was Straus staff’s total contempt of conservatives and the manner in which they were referred to as idiots, mother f***ers and stupid. These words will become familiar as this is the wave of obamatrashtalk. We also better know that every liberal Republican hates all conservatives…sends a warm chill up your spine doesn’t it? Interesting enough, when I was going to photography seminars, an instructor once said, ‘Remember you will attract customers of your ‘kind’ either ‘warm fuzzes’ or ‘cold prickly’ customers. He was so right. My customers for the most part were ‘warm fuzzes’. So now I attract crazy conservatives…like myself, according to Straus and all liberal Republicans. It is important that we note that Joe Straus is from San Antonio, a city that just went ape over Obama and his mini me’s the Castro brothers. So let’s consider that if we continue to allow this infectious condition to spread throughout Texas how long before we turn blue. Never say Never. It seems ‘modern’ Republican Joe Straus has been a thorn in the side of most conservatives since his election to Speaker of the House in January, 2009. He won with 70 Democrats supporting him for Speaker. That speaks volumes for Straus. Straus was reelected as state representative for HD121, a San Antonio district comprised of Republicans who believe that Straus is their man. A BLUE county state representative will now dictate policy over the entire RED state of TEXAS. 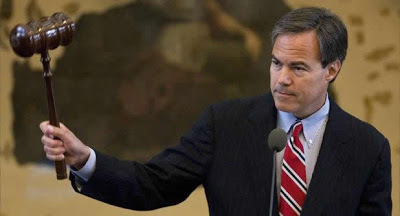 It stands to reason that the very blue Democrats are going to put pressure on Straus to make sure he does not tip over to the Right side because he must tip over to the Left side, after all didn’t they make him Speaker of the House? Brian Chasnoff of the ultra liberal Express n News wrote an interesting article, but we already knew what Chasnoff told his readers. Again what is disconcerting is the arrogant State Rep Trey Martinez Fischer, HD116, boldly stating that “One thing we can do, is beat on Joe so hard to prevent him from falling off the right-wing cliff. If guys like me sit silent, then you'll just see Joe fall off the right-wing cliff. And nobody wants that. So my job is to bang on him.” So if the redistributing bangers are going to ‘bang’ on Straus, will the crazy conservatives also ‘bang’ on Straus? 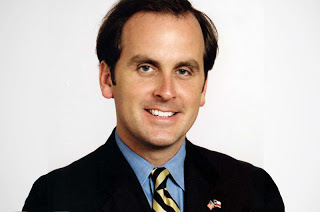 State Rep. Bryan Hughes, R-Mineola, filed to run against Straus as Speaker of the Texas House even before the May primary, even before the outcome of the HD121 race results. Does Hughes have a chance? Pro Life groups such as Texas Alliance for Life have endorsed Joe Straus so the attack has to come elsewhere. State Rep Burt Solomons, chairman of the House Redistricting Committee chose not to run for a 10th term. Could it be his redistricting ‘mess’ is to blame? Letters and emails have surfaced on redistricting that show how biased Straus’ people were against the conservatives. 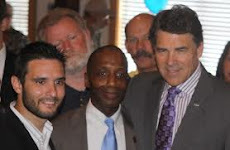 As far as I can remember Straus did not pledge to Governor Rick Perry’s Texas Budget Compact. 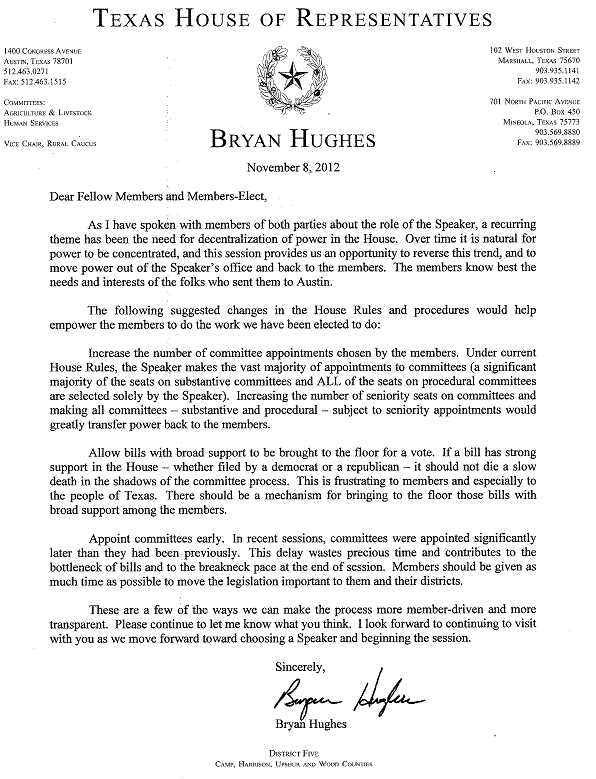 Empower Texans have come out for Hughes but getting other state reps to vote against Straus is the clincher. Straus can only lose if Texas State Reps unite and gather 76 votes for Hughes, otherwise brace yourself for a rough roller coaster ride for the 83rd Texas Legislature starting January 8, 2013. And to tell you the truth I am tired of this roller coaster ride. Texas is in yours hands. It is you that can make a difference. If you want change in the Texas House, then call your state rep and ask questions, let him know that conservatives do matter. In his quest for the position of Speaker he is being supported by 70 Democrats.